Maude Mary Puddy was born on 27 March 1883 at Brompton, Adelaide. She was the third daughter of English parents Albert Puddy, journalist and music teacher, and his wife Jane, daughter of Samuel Coombe. From childhood Maude showed an extraordinary talent for music. Albert Puddy was for many years on the literary staff of The Advertiser and for more than 50 years a teacher of pianoforte. In the 1860s and 1870s he was a leading performer on wood-wind, brass and other musical instruments as well as an organist of the Hindmarsh Choral Society and All Saints' Church, pianist for the Hindmarsh Glee Club, bandmaster of the Hindmarsh Brass and Reed Band, and musical director of other organisations. He was also for 34 years honorary secretary of the Hindmarsh Town Mission. Albert was a prominent worker in the Methodist Church, a Justice of the Peace, and a Freemason. He took a keen interest in politics, and was well versed in current events. Albert Puddy died 17 December 1937. His wife Jane, who was a daughter of the late Samuel Coombe, and who was also an old colonist, had died three years earlier. Albert, a self-taught musician, gave Maude her first piano lessons. She attended the Hindmarsh Public School and later the Advanced School for Girls in 1896-1900. First playing in public when only eight, she gave a highly praised recital, when she was nine, at the Hindmarsh School’s end of year concert. It was her first of many public performances in churches, town halls and schools. In January 1895 she became a pupil of E. G. Reimann at the Adelaide College of Music in Wakefield Street. When this merged with the new Elder Conservatorium of Music at the University of Adelaide three years later, Maude Puddy was granted a scholarship and continued studying with Reimann. She won scholarships and numerous prizes for piano, composition, and accompanying, as well as a first class pass at the examination of the Adelaide University in the junior division in pianoforte. In 1897 she gained a first class pass with credit at the senior examination. In 1900 Maude was the first to gain the Diploma of Associate of Music, and in December 1902 the Director’s prize for best performer on the pianoforte. This was followed by her graduation as a Bachelor of Music in 1905, the first to do so. On 28 November 1905 a complimentary concert was given to farewell Maude Puddy before she left for Germany, with her sister Rosa, her companion during the next fourteen years. Before leaving Maude had obtained several references which she would be able to use in Europe. Among them was one from the Chief Justice of South Australia Sir Samuel James Way. He wrote, ‘Her course of study in both Institutions extended over eight years during which she won Scholarships entitling her to free tuition for six years. She has been a diligent and successful student and is a brilliant pianist. Her character is irreproachable’. The Australian Christian Commonwealth wrote that among the multitude of admirers and well-wishers the Methodists of South Australia have shown the greatest interest in her remarkable career and now wish her the highest possible success. Maude and Rosa left Adelaide in December for Melbourne to catch a steamer for Europe and left from there on 2 January 1906. After a short stay in London she went to Vienna ‘to study with that prince of pianoforte Theodor Leschetizky’. She remained in Vienna for seven years. During her time in Vienna she attended many concerts and operas and continued taking lessons from Leschettzky. Maude was always smilingly and affectionately referred to by Leschetizky as ‘My Philharmonic Orchestra’. She was very proud, and rightly so, of the fact that he dedicated one of his last compositions to her. After a successful début in the Bösendorfer Salle, Maude gave concerts in Vienna and Berlin and became one of Leschetizky’s student teachers. 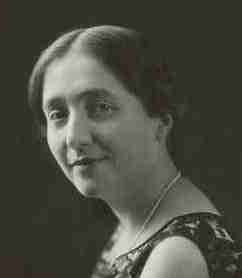 Maude soon became well known as a fine pianist and a good teacher. Leschetizky attested in 1909 that 'her notable talent has helped her not only to perform as a distinguished public piano player, but also to teach with an unusual measure of success'. After a successful pianoforte recital in Vienna in January 1912 the Deutsches Volksblatt stated that the young artist was one of the best of her kind. She obtained a hearty applause and eager appreciation from a numerous audience. In 1913 Miss Puddy went to London and spent World War I in England, teaching and giving concerts for the troops and fund-raising recitals for the British Red Cross Society. 'It was really beautiful to play to the wounded and convalescent men', she said. At the start of a concert given in November 1915 she was greeted by the Australian soldiers with a welcome coo-ee. In January 1918 her father received a letter in which Maude described a lengthy tour she had made with a concert party through all the Australian camps in England. She never lost an opportunity to brighten the lives of the brave men fighting for their country, said the reporter. She returned to Adelaide in early January 1920 on the Aeneas, after an absence of 14 years, to fill a teaching position at the Pianoforte division of the Elder Conservatorium. One of the first things she did was holding a reception at the home of her parents on 192 Barton Terrace. On 24 April she gave a pianoforte recital in the Adelaide Town Hall, which caused considerable interest in the local musical circles. In August 1920 she gave another concert at the Elder Hall, which turned out ‘one of the finest musical treats of the kind enjoyed by lovers of pianoforte music’. For more than an hour and a half she kept the exceptionally large audience under a ‘magnetic spell of appreciation’. The evening proved a triumph of art in Adelaide. The local papers informed their readers that ‘Her gifts as a pianist are acknowledged by all who have had the privilege of hearing her’ and, ‘judging from the ticket sales, South Australians appreciated her talents and powers’. She went overseas again in March 1929 to hear some of the finest music the old world had to offer. She visited Naples, the Dolomites, Vienna, Germany, Paris and London where she played at the Aeolian Hall in the Clive Carey Song Recital on 14 October. When back in Australia she continued playing and teaching. In September 1935 she read a most interesting paper on the life and work of Theodore Leschetizky (1830-1915) with whom she had studied in Vienna. After a lengthy absence Maude played once more with staff members of the Elder Conservatorium of Music on 24 August 1936. She also played several times with the Adelaide Symphony Orchestra. Two years later, on 23 November, students of Maude gave a piano recital at the Elder hall in her honour. Her work has been continued by her students who have taught all over Australia. In May 1949 Maude Puddy, who had never married, retired after 28 years at the Conservatorium. She had played on radio and with the Adelaide Symphony Orchestra and her prowess and popularity as soloist, and particularly as a player of chamber music in Adelaide and interstate, always drew enthusiastic reviews. In August the South Australian magazine Homes and Gardens wrote, ‘The name of Miss Maude Puddy is a household word in the Adelaide musical world, so well-known and admired is she’. In December 1953 the Sunday Advertiser reported that a Maude Puddy Scholarship would be established to the Elder Conservatorium in 1955. 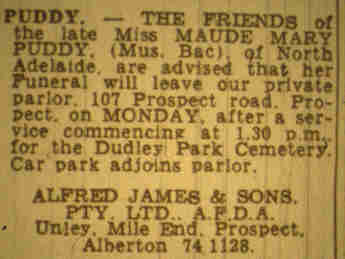 Maude Mary Puddy died on 1 August 1974 and was buried in Dudley Park cemetery, where already eight other members of the family were interred. It seems that at the time of her death she no longer was a household word or well known. Except for a death and funeral notice, none of the Adelaide papers reported her death or published her obituary. To add insult to injury there is no evidence of any of the graves. The 99 year lease expired on 1 August 1983 and the site is now covered with a new road. Maude Mary Puddy left considerable bequests to Methodist institutions and for medical research. X denotes where the Puddy graves used to be.